We are not crazy about throwing or sprinkling any seeds on the ground, actually. Birds, insects and small mammals would be happy to dine on them. Most seeds need good contact to earth in order to germinate, and many sprout best beneath the soil. Before any planting is done, by seed, transplant or division, the soil must be prepared to accept that plant or it will not thrive, and probably not live. The answer to your question about which seed is good is that the best seed to put into your garden is a seed to a desirable plant that is native to your area. Sprinkling any seeds on lawns is pretty well doomed from the start; again, you have the need for seed-to-earth contact which you will not get with grass interfering. And having the seed on top of that grass will make it that much easier for the beasties to make a meal off the seeds. What seeds you plant, where you plant them, when you plant them and how you plant them are all dependent on what plant you hope will come up from them. 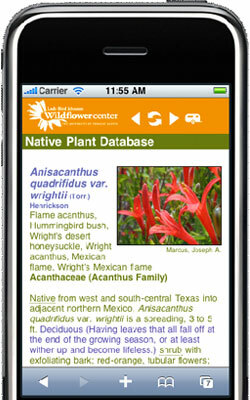 We are going to choose some plants that are native to the Austin area and when you follow the plant link to our webpage on that plant you will have the opportuniity to see the suggested method of propagation, what color blooms (if any) it will have, usually some pictures of the plant, even sometimes of the seeds, whether it is annual or perennial, sunlight, water and soil needs, growing conditions. At the bottom of that page, under Additional Resources, there will be links to the USDA Plant Profile Map and Google on that plant. So: (1) Select the spot (2) Decide what type plant (grass? tree? perennial? etc) you want in that spot (3) Identify the growing conditions of that spot (sunlight? soil? moisture?) (4) look at webpages of plants native (in your case) to Travis County (5) compare the growing conditions in that spot to the recommended growing conditions of the selected plant (6) If you find a good fit, find out the best way to propagate that plant and do it! By the way, this member of the Mr. Smarty Plants team chose some of her own favorites for this area and most, if not all, of them grow at the Lady Bird Johnson Wildflower Center. April 22, 2008 - Can I grow grapes from seed? If so, what is procedure?